The New York City Skyline may be one of the most recognizable in the world. From the Empire to the One World, this concrete jungle is full of iconic structures. Come check out where to see the five best places in New York City to see the Skyline! Welcome to the beach baby! Yes you read that right, a beach in New York City! The East Huddson River Park is just a dream all around. Green grass park, the Hudson River, a mini sandy beach, and THIS view! A dream is it not? One thing I absolutely love about this vantage point, it the clear view of the Empire State Building! So many skyline spots include the One World Tower, but it is not always as easy to see this guy. Also this spot is beyond picturesque with the seagulls flying by and waves rolling in. You cannot come to New York, and not see the skyline from above. To see a sea of buildings and life squished between blocks from above, is truly a New York experience. There are lots of places to see they city from above, but The Empire is just the classic must see. Not only is it an icon of the whole city, but it is also one of the tallest, guaranteeing you a magical view no matter what. You do have to pay for access, but it is worth every penny. Who doesn’t love a moving vantage point? Walking the Brooklyn Bridge should be on everyone’s New York list, but especially if you love the skyline like me. It is such an incredible way to see the city because your view point is constantly changing! From beautiful views of the river, to the buildings, and watching all of the New York life fly by on bikes, cars, and feet is just such an amazing experience. The best part? Its totally free! I would be lying if I didn’t mention this was my favorite spot. My Brooklyn best friend showed us this spot about 3 years ago, and now it is a tradition to go back every year! It is such a beautiful spot. You can see the skyline, Lady Liberty, and the Brooklyn Bridge in all of its glory. It is not far from DUMBO and you can walk along the park path for quite a while. There is also benches here making it a perfect spot to just come vibe! Oh and you can come any time of day :) It always looks amazing! The Staten Island Ferry should be on everyone’s list because not only is it a free way to see the beautiful skyline from the water, it is also a free way to see the Statue of Liberty! You can catch this ferry every 30 minutes in lower Manhattan. I have all the details you need to know in this post! Seeing the skyline from the water is such a unique experience - and in my opinion that much more magical! New York City is truly a place like no other. You can find just about every culture represented, the most unique experiences, and some of the best pizza in America. People wait and dream their whole lives to explore this city. 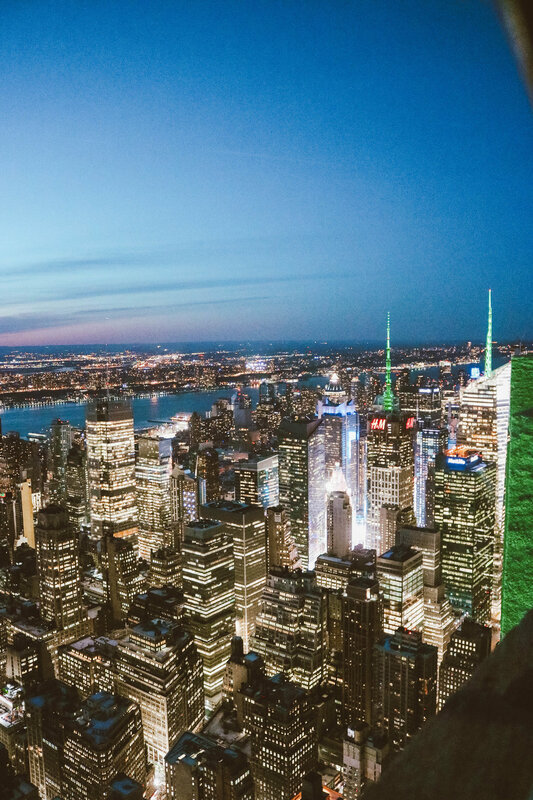 So when you get your chance to walk this concrete jungle make sure you add these 10 Experiences in New York City to your list! Let’s face it - New York is full of magical experiences and adventures that make you feel like you are on a movie set, or just living a double life! Walking the High Line to see Hudson Yards is a little bit of both!! Not only is the high line it’s self a must see and do while in the City, it now leads you to one of the coolest structures out East. So if exploring Chelsea, the high line, art galleries, and Hudson Yards wasn’t on your New York list before… it will be now! See The Statue Of Liberty For FREE! When you think of New York - a few symbols might pop into your head. The Empire State, Central Park, a slice of Pizza, and of course the Statue of Liberty! On my last two trips to the city, seeing Lady Liberty has felt like a far out dream. For one, we always come in March and it is FREEZING. So anything by the water just sounds like a nightmare. And two, we are very frugal travelers. Paying $25+ each is just not in the New York budget right now! In doing my free research - I stumbled upon the Staten Island Ferry! If I know anything about New York - it is that you will never go hungry! With Endless options for food and tasty treats on every corner, it is almost impossible not to spend the whole trip with a fork in hand! Check out Five Eats You Can’t Miss In New York!